This Wednesday, the ANSWER Coalition is staging a rally at the Hollywood Military Recruitment Center in Los Angeles to protest the U.S. Invasion of Afghanistan that was launched nine years ago. 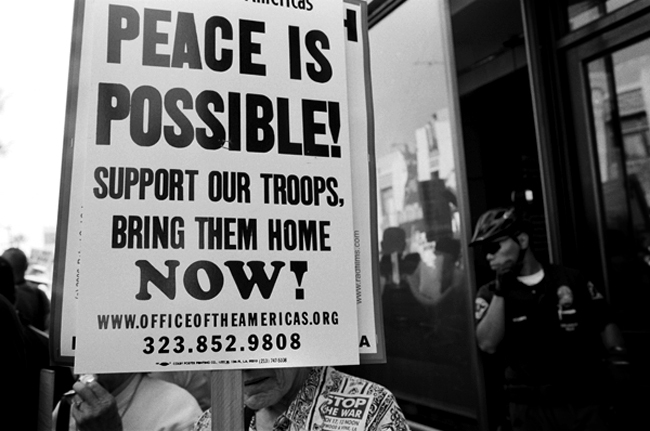 On Oct. 6, veterans, anti-war activists, students, military families, and working people will converge on the Hollywood Military Recruitment Center to protest and take action. We will be at the Military Recruitment Center to demand an immediate end to the U.S./NATO war on Afghanistan. We will also demand an end to the U.S. military preying on working-class youth, especially youth of color. Young people are struggling to get access to a college education, jobs, and benefits, yet the war machine continues to send them to kill and die in this criminal war. Military recruiters must get out of our communities! So if you’re in the Hollywood area on Wednesday afternoon with a camera dangling around your neck, be sure to find your way over to the recruitment center for some protest fun.